Cornelius Vanderbilt Whitney built a more spectacular mansion on the present site of the Bergdorf Goodman store overlooking Central Park at Fifth Avenue and 58th Street, and Henry Clay Frick built a very elegant home and garden to house his very great art collection on Fifth Avenue at 70th Street and Andrew Carnegie built a massive house with a very large garden directly across 91st Street from this structure, but only Otto Kahn built a palazzo of which the Medicis would be proud. This large and very impressive Italian Renaissance-palazzo style mansion is modeled after the Cancelleria in Rome and was designed by J. Armstrong Stenhouse and C. P. H. Gilbert. "At the Kahn house, the architects adopted features of the Roman palace in a somewhat literal manner, using them in the creation of an individual work appropriate for the lifestyle of a wealthy early 20th-century New York family. Especially novel features are the enclosed drive which allowed family and guests to arrive in their new automobiles without public scrutiny and the impressive interior courtyard. The enormous house was commissioned by Otto Kahn, a partner in the banking firm of Kuhn, Loeb & Co. During their lives, Mr. and Mrs. Kahn were best known as lavish patrons of the arts; the Metropolitan Opera was a favored recipient of their largesse. As at the Carnegie House across the street, the Kahns had a large staff. In 1925, Mr. and Mrs. Kahn and their two children were served by fourteen live-in employees, but unlike Carnegie's staff, the Kahn's servants were a multinational group, including people from Scotland, England, Ireland, Norway and Switzerland. Shortly after her husband's death in 1934, Addie Kahn sold the house to the Convent of the Sacred Heart which uses the building as a school for girls. The building was cleaned and restored in 1994"
The Sacred Heart school is the most exclusive Roman Catholic school for girls in New York. It also owns the Duchesne School in the very handsome mansion that abuts this, the former James A. and Florence Vanderbilt Sloan Burden Jr. house designed by Warrren, Wetmore & Morgan. 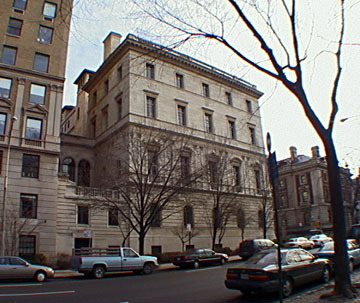 These two properties are to the west of the Consulate of the Russian Federation at 9 East 91st Street that originally was the John Henry and Emily Vanderbilt Sloan Hammond house that was designed by Carrère & Hastings and this mansion "row" is perhaps the most impressive in the city, especially as they face Andrew Carnegie's enormous house. This building was the setting for the movie, "The Anderson Tapes," and has been often rented for weddings. Otto Kahn erected a huge estate in Dix Hills on Long Island. C. P. H. Gilbert was the architect of several other important mansions on Fifth Avenue's "Millionaire's Row." One block to the north on the avenue, for example, he designed the townhouse for Felix and Frieda Warburg that is now the Jewish Museum (see The City Review article). In his book, Mr. Dolkart noted that "Apparently, Felix and Frieda Warburg, prominent members of New York's German-Jewish aristocracy, were so impressed with the François I chateaux that C. P. H. Gilbert had designed for the Fletchers [at 2 East 79th Street][see The City Review article] and Woolworths [formerly at 990 Fifth Avenue]farther south of Fifth Avenue, that they commissioned a similar house for themselves."